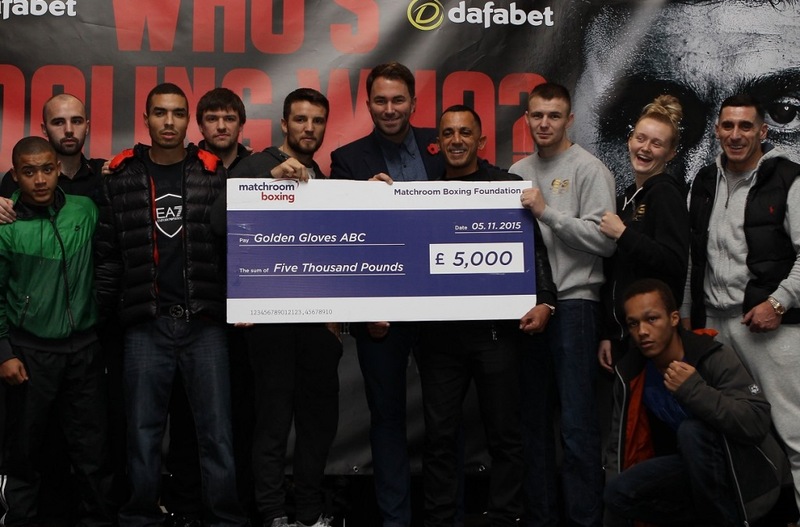 The Golden Gloves ABC in Liverpool received a £5,000 donation today as the first amateur boxing club to receive funding and support from the Matchroom Boxing Foundation. Promoter Eddie Hearn stepped in with emergency funds in June when the club were forced out of the Toxteth-base it called home for 12 years through rising rents, but with this cash-injection and the keys for a new gym being collected on Tuesday, the future looks bright for the famed club. “The Matchroom Boxing Foundation’s financial help and support has saved this club,” said Golden Gloves ABC coach Wayne Smith. “The club is vital for the community and it means the world to some of the kids we have coming down. There’s some real talent in the club, but more than that, Golden Gloves gives them something to focus on and shows teaches them so much more about life than just how to throw a jab. Hearn said that he intends to initially assist up to 20 clubs all over Britain through the Foundation, speaking of his desire to inject both money and expertise into the grassroots of the sport, and reach out to the government and councils to assist these important institutions. “It is important to invest in all levels of the sport,” said Hearn. “We have the elite boxers in the country and we’ve brought many Team GB amateurs into the paid ranks, but I feel we have a responsibility now to help the grassroots of the game. “We’re not just going to write cheques and walk away – the support is more than just financial, it’s equipment, tickets and perhaps most importantly, advice. “The Golden Gloves ABC is just one of many clubs that is in need of help. The money is great but we are here to offer them advice to attract more support. The cash injection keeps the going in the short-term, but it’s the support that will see them grow and thrive. “Wayne and the rest of the people at the club give up their time to keep the club going – without support, amateur clubs are just not viable businesses, and we need to look at them as businesses for them to survive.